As of late, tennis has revolved around the growing legacies of its greats — today’s Roland Garros ladies’ final was poised to be more of the same, with Serena Williams trying to win her 22nd Grand Slam singles title and tie Steffi Graf for the second time in 2016. But, from the start of today’s final, a strange thought entered my mind, “I don’t know if Serena can beat Garbine today.” It wasn’t a lament over Serena not playing her best, or a latent conviction that she would, once again, find another gear and overcome her young opponent. Instead, it was a genuine question — one that has rarely been asked of Williams over the past decade. And, yet, there she was — Garbine Muguruza, evoking shades of Steffi Graf, with her bouncing ponytail and her easy power. While Muguruza has said that Serena was her role model, there’s an unmistakeable thread to the one-time Fraulein Forehand in Muguruza’s power groundstrokes. Not only did Muguruza easily handle Williams’ power, but she repeatedly turned Williams into a spectator as she changed the direction of shots and hit them past the American. 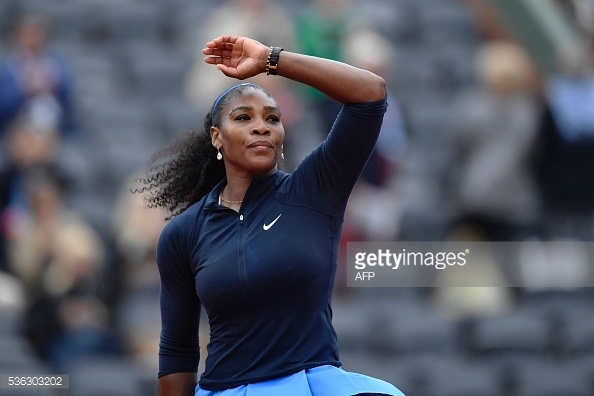 Williams fought gamely, but this match was never really in her grasp — not that it couldn’t have been. Muguruza hit nine double faults, and Serena converted only two of eight break points. But, there was a sense of the inevitable about today’s final — and for once, it wasn’t on Williams’ side. Just as inevitable are the predictions about how far Muguruza can go. That’s always the hardest call. She certainly showed an appetite for competition in winning her first Slam title. It’s hard to imagine her feeling intimidated by anyone else on the tour, given how she handled Williams today. But, tennis has been stingy in giving us new contenders to follow — Petra Kvitova has been invincible on two fortnights at Wimbledon, and all too fallible the rest of the time. A combination of sophomore slumps and injuries have sidelined Eugenie Bouchard and Sloane Stephens from the latter stages of the Slams, since their breakthrough years of 2014 and 2013, respectively. It’s hard not to be bullish on Muguruza — not only did she compete well, but her game matches up well against the power game that dominates the tour these days. Judging from her composure today, she might just be ready to take over the top spot. That said, it’s far too early to be writing farewell addresses for Serena Williams. The last time a player dominated Serena in a Slam final was 2004, and the player was Maria Sharapova. Sharapova got one more win against Serena later that year — and she hasn’t won again in over 12 years. That’s not to say that Muguruza can look forward to 12 years of losses, but Serena is an excellent problem solver. Muguruza has given her a new challenge — and it’s a given that she will do everything she can to meet that challenge. As for matching Graf’s record, as of now, I believe it’s still a matter of when, not if, she achieves that goal. Depending on her own health and the consistency of the competition, Serena still has a reasonable shot of overtaking Margaret Court’s all-time record of 24 Slam titles. But, from now on, we can no longer say that the only person who can beat Serena Williams is Serena Williams — Garbine Muguruza showed us that today. Wimbledon just got a lot more interesting. I think Garbine can win more in the future, but may not reach the wimbledon final in a few weeks. Would you say that Stosur somewhat dominated Serena in the US open a few years ago?